Oliver O. Howard commanded XI Corps, Army of the Potomac. On 1 July, XI Corps arrived just after John Reynolds' I Corps. After placing batteries on Cemetery Hill, his troops were engaged north of Gettysburg by Richard Ewell's II Corps, Army of Northern Virginia. Breaking, XI Corps fell back through the town onto Cemetery and Culp's Hills. At about 3:30 in the afternoon of 1 July, Howard was approached by Winfield Hancock with orders from George Meade putting Hancock in operational command of all of the Federal troops currently engaged at Gettysburg. 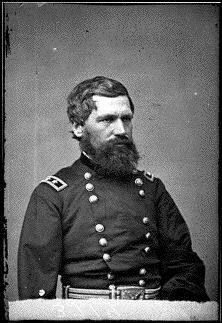 Howard refused to relinquish command because his promotion to brigadier predated Hancock's by 28 days, and an truce settled between the two corps commanders; Howard was to control the area to the east of the Baltimore Pike and Hancock to the west. Upon his arrival with XII Corps, Henry Slocum took operational command of the Federal forces at Gettysburg until Meade's arrival late that night. During the Second Day's fighting, Howard sent troops to reinforce the Iron Brigade and George Greene's brigade on Culp's Hill and, later, his troops held off an attack on Cemetery Hill made by Jubal Early's division. After the War, there was much controversy as to whom the credit for selecting the ground for battle should go. Supporters of Hancock pointed to his being in overall command on 1 July; supporters of Howard brought up his leaving Adolph von Steinwehr's division on Cemetery Hill as he went to the aid of I Corps; and even Dan Sickles claimed credit for the selection by his positioning of III Corps on 1 July.